As clinicians go about their day in a healthcare environment, their IT needs to keep pace with their workload. These fast-paced environments require a comprehensive approach including mobile devices, security and coordinated management of the entire access system. 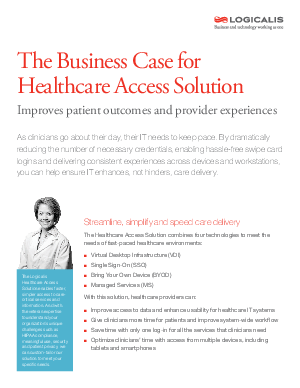 Download this whitepaper to learn about the business case for healthcare access solutions to streamline, simplify and speed access to care delivery anytime, anywhere.